“McAllen. Why have I heard of McAllen?” my friend says when I tell him about spending the holidays in my hometown. Perhaps you, like my friend, have recently heard of McAllen, but the context escapes you. 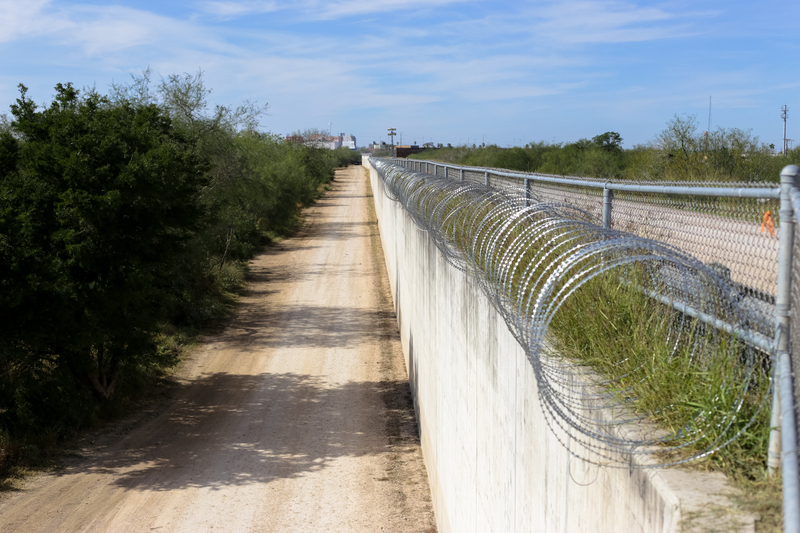 Chances are good that you heard of this Texas border city in the news as the location of President Trump’s most recent visit, during which he gave a talk reinforcing the importance of border security. Here in this borderland, the seemingly-distant events of children being separated from parents in detainee centers have caused continued national and even international uproar. This is where I come from. And it is to this backdrop that Hugo and Eunice Moya have rooted their lives, raised their family, and ministered to immigrants over the past 25 years. When I visited the Moyas to see how their work had changed since Nations last visited them, I found a couple dedicated to ushering in the Kingdom—far removed from the cushy seats and perfectly curled hair of newscasters discussing the border. 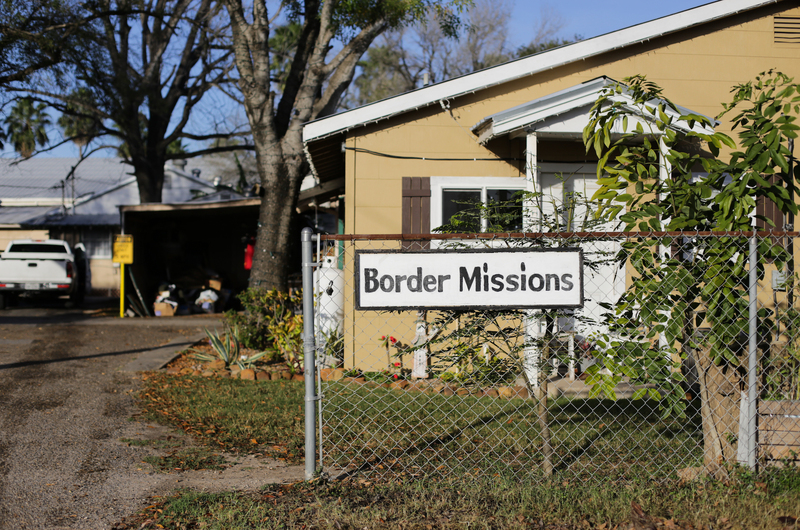 Since Nations last checked in with Hugo and Eunice, they’ve continued to faithfully serve the immigrant community along the Mexican-American border in the McAllen/Pharr area in deep South Texas. 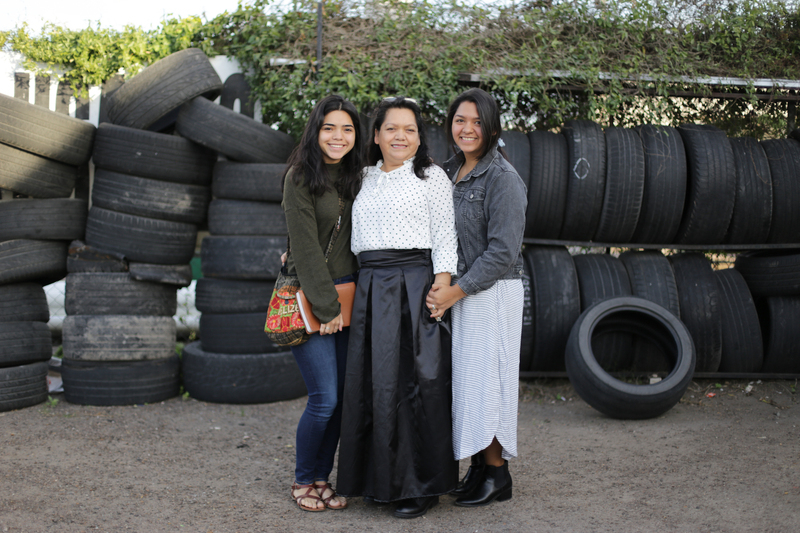 The venue for the Moya’s house church, Iglesia Misionera Cristo Vive, has relocated from their driveway to the back room of a tire repair shop formally used to house spare tires. 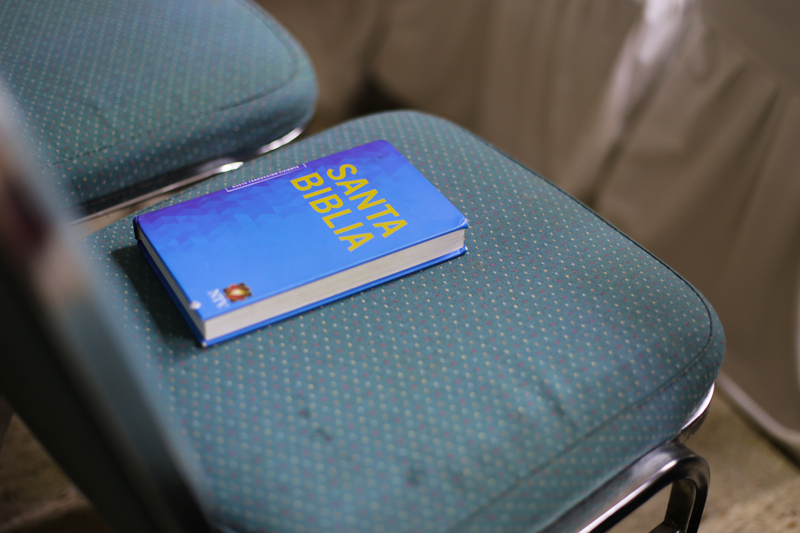 In June, Hugo started a Bible Institute where local immigrant pastors and church leaders—many of whom are undocumented and unable to attend seminary—can receive theological training in order to better serve their local congregations. 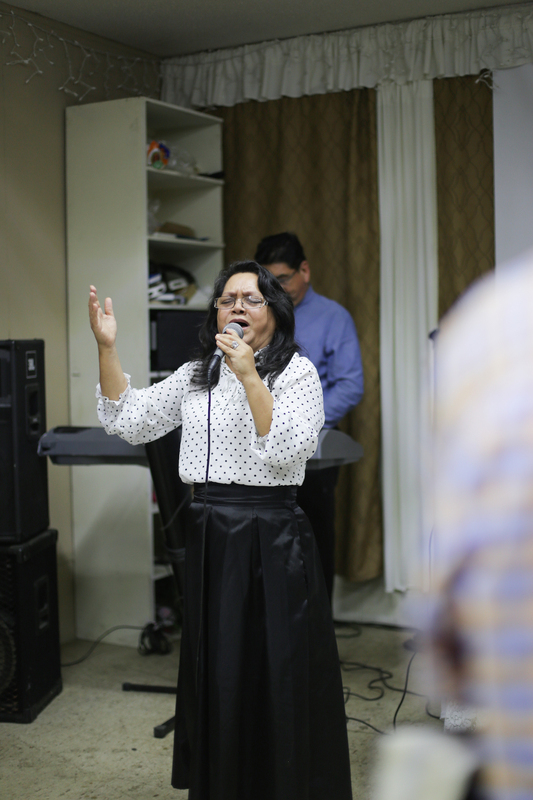 And each week, despite escalating cartel violence in Tamaulipas, the Moyas travel across the border to minister to churches and encourage pastors in Mexico. 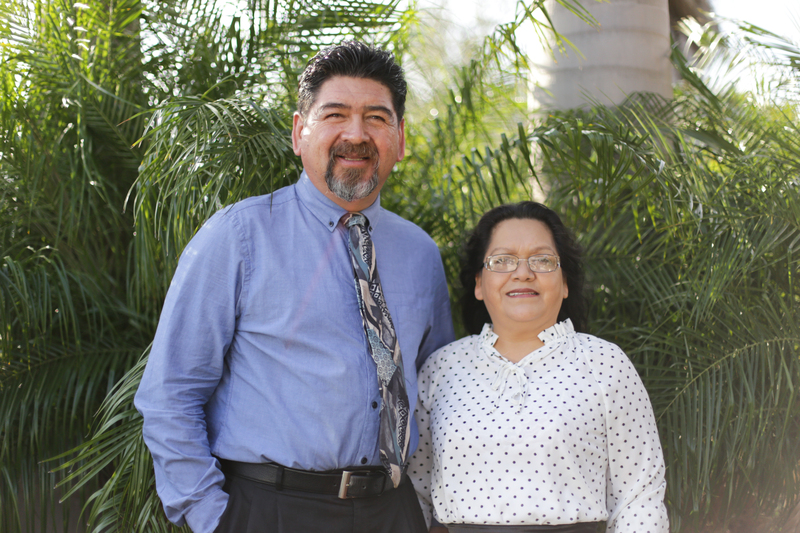 Hugo and Eunice Moya have been serving the immigrant community on the US- Mexico border for the past 25 years. They stand outside of their home in Pharr, TX before a Sunday church service. 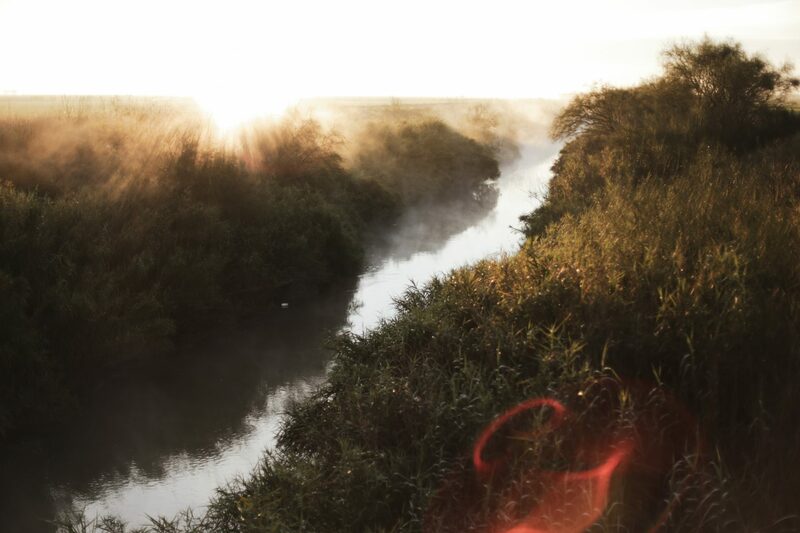 The Moya’s ministry is located in Pharr, Texas in the Rio Grande Valley, home of the Rio Grande River. The Rio Grande is the fifth longest river in the United States and forms a 1,255 mile segment of the border, acting as a natural barrier between the United States and Mexico. 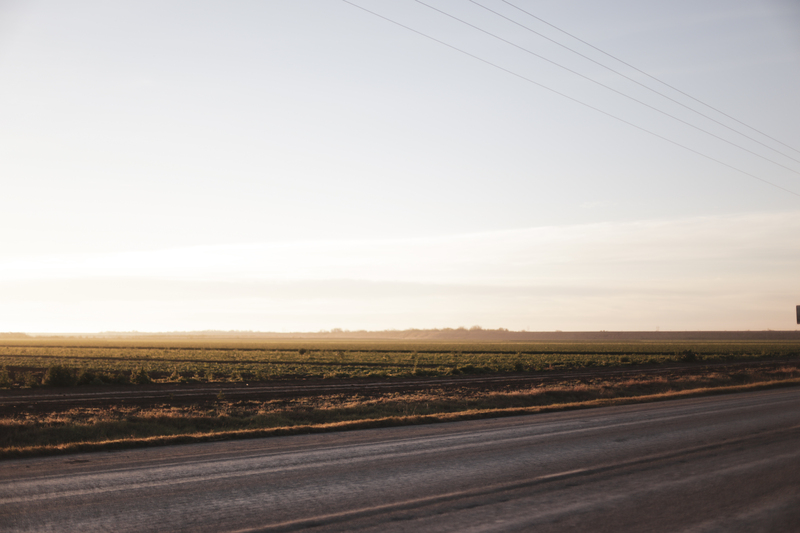 Driving into the 70,000 person community of Pharr, TX, fields of local produce line the landscape—many of which are cultivated with the labor of undocumented immigrants. 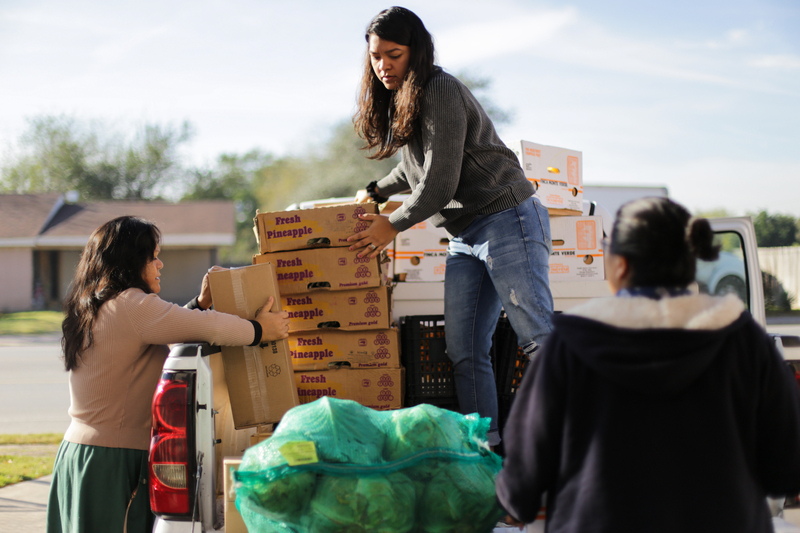 Eunice receives food from Border Missions, a nonprofit organization located in Hidalgo, TX, that provides food and clothing to those in need living along the Mexican-American border. L: Francisco is a faithful volunteer at Border Missions. Here, he separates coffee beans into bags to be divided amongst the boxes designated for different churches. R: Eunice packs and gives out food boxes to her neighborhood, congregation, and when notified, those who have just recently received asylum at the US-Mexico border. Elida, left, and Angelita, right, are members of the Moya’s congregation and faithful helpers to Eunice during weekly food distribution. Eunice and her daughter, Mina, pack their car with the food donated by individuals and companies in the Rio Grande valley area. 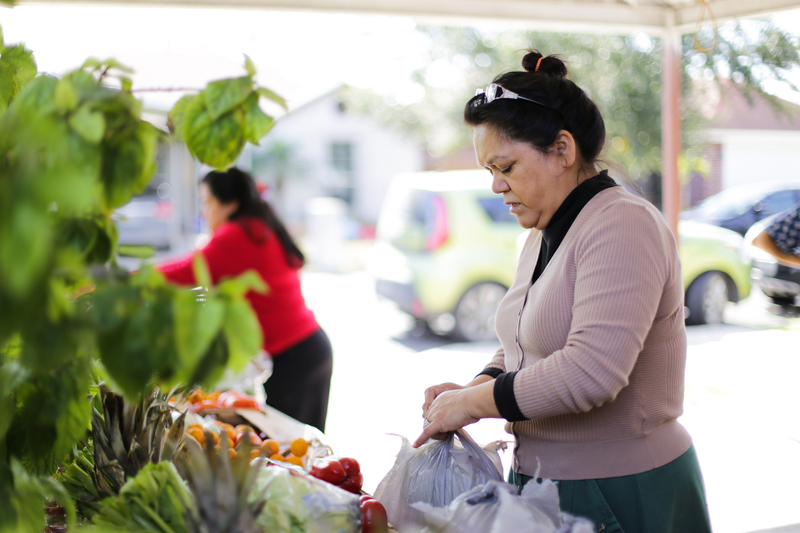 Eunice divides produce into boxes to be distributed to her neighbors and community members. This photo was taken three weeks after Eunice was in a car accident that rendered her vehicle beyond repair. “One week after the accident, she was already back to serving (distributing food),” says her daughter Mina. The US-Mexico border takes many forms. Here, concertina wire crowning a concrete slab conjoin to make a physical barrier. In the distance, the McAllen-Hidalgo-Reynosa International Bridge, one of the twelve international border crossings in the Rio Grande Valley, links the U.S. city of Hidalgo, TX and the Mexican city of Reynosa. Sunday services at Iglesia Misionera Cristo Vive are now held in the evening, but preparations start to take place in the morning. 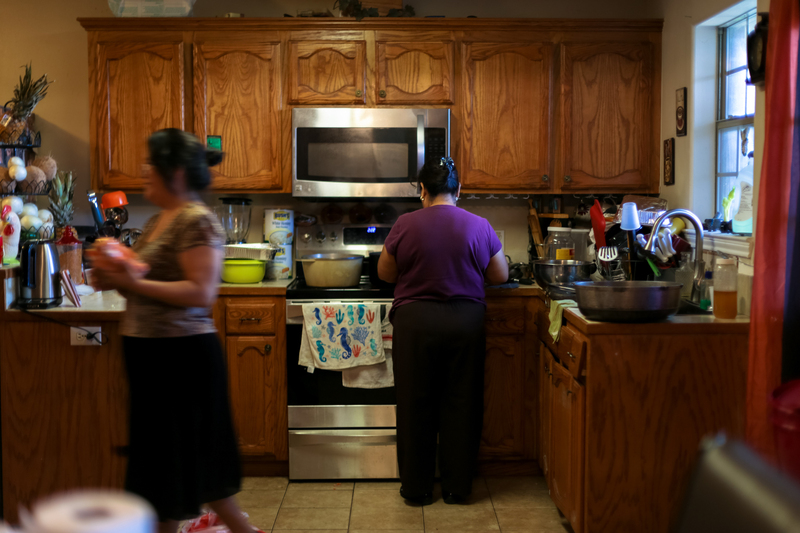 Eunice and Angelita prepare the meal for the time of food and fellowship that follows every service. The Moyas ministry has expanded to host short term trips for those who would like to experience what ministry looks like on the Mexican-American border. 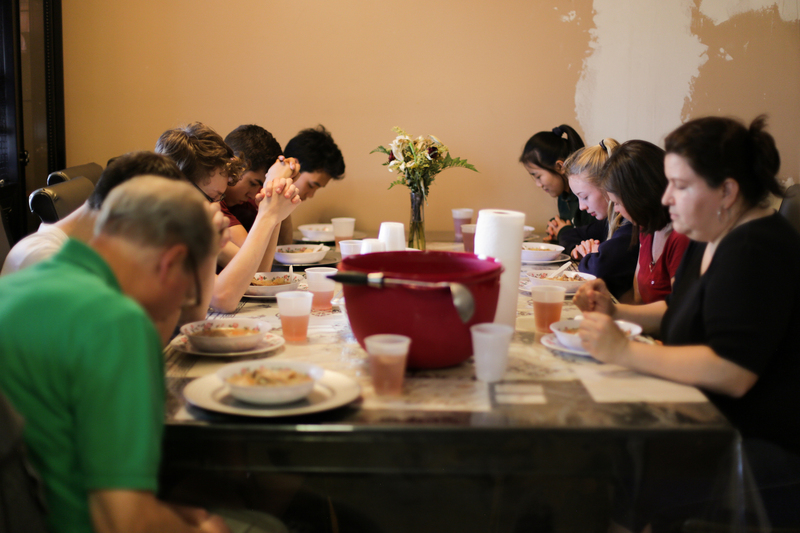 Here, a visiting team from Washington gather around the Moya’s dining room table for a meal of steaming caldo and fresh tortillas before attending the evening service. L: Iglesia Misionera Cristo Vive now meets in a spare room connected to a tire repair garage, the workplace of a congregation member. 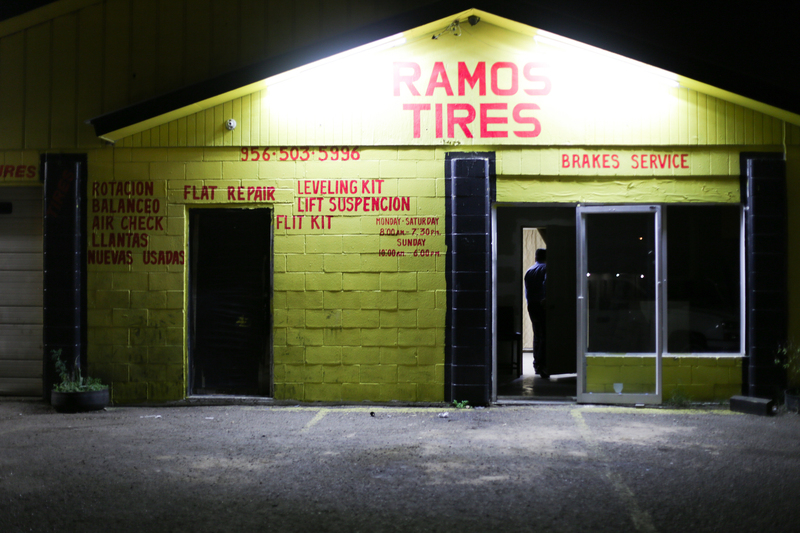 R: Hugo and congregation member, Fernando, stand at the door of the tire shop to greet guests. During the day, Fernando works as a mechanic at the same shop. Eunice stands outside the new gathering place for Iglesia Misionera Cristo Vive. The Moya’s ministry is very much a family affair. Eunice’s daughters, Alpha, left, and Mina, right, are both college students but help with their parents’ ministry from translating to orienting visiting teams. Eunice leads worship while Hugo plays piano and congregants young and old raise their voices and shake tambourines. Services are held in a room connected to the tire repair shop formally used to house spare tires. During the week, this room is used to conduct classes in biblical and theological training for local pastors and church leaders. After prayer ministry and fellowship following the service, church members return home under a dark night sky. But for Hugo and Eunice, their tireless devotion to the gospel of Christ and the building of his church plays out as they continue their night with a series of home visits. 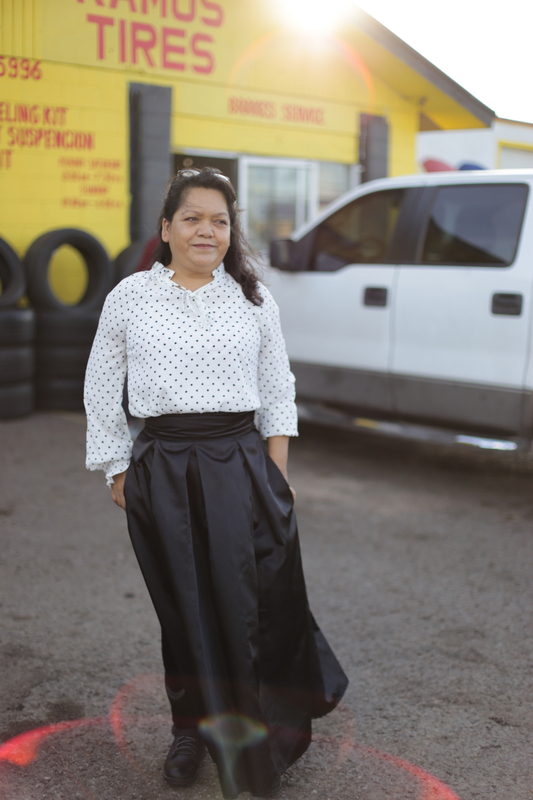 Anastasia Waltschew is a documentary photographer from south Texas and based in Los Angeles, CA. She is a firm believer that beauty and human-to-human interaction are part of the antidote to poverty, division, and distrust. 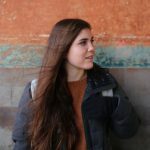 Her work seeks to challenge conventional thinking and inspire mutual understanding between peoples, especially in areas of conflict. Whether she’s here or abroad, she’s always in search of broadened horizons, new understandings, the best hummus, and the strongest chai. View her work at anastasiawaltschew.com.